U.S. 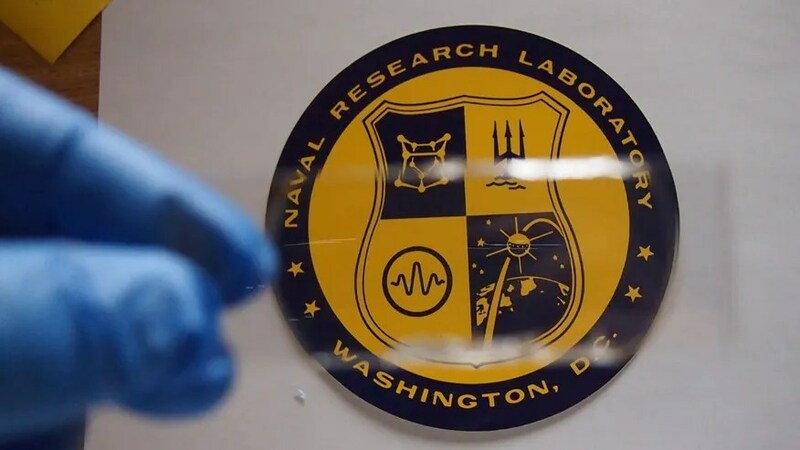 Naval Research Laboratory (NRL) scientists have created a remarkable transparent armor that is lightweight and still provides excellent protection. Nearly as transparent as glass, the armor is essentially invisible protection from bullets. And if the armor surface is damaged, warfighters could fix it on the fly with something as simple as a hot plate and the armor will meld itself back together. Think about how “bulletproof glass” (a misnomer since it is often only bullet resistant) works – you can see through it and it stops bullets. Now what if you could do that for body armor and helmets? That’s the idea here. This next-generation armor advance could also amp up transparent bulletproof walls to protect tourist attractions from the attacks we’ve seen in Paris and most recently, in London. What’s the armor made of? The transparent polymer armor gets its transparency from something known as tiny crystalline domains. The armor itself is made up of alternating layers of elastomeric polymer combined with a harder material substrate. NRL scientists conducted tests using polymeric materials as a coating to try to enhance impact resistance. By applying layers of the special materials to body armor and helmets, the result was better protection for warriors against bullets. The armor also helped reduce the impact of blast waves caused by something like an IED explosion, which could potentially help prevent brain trauma. If you picture a windshield that has been struck by a rock kicked up while driving, the rock’s impact may cause damage that makes it difficult to see through the windshield. One of the amazing things about this see-through armor is that when it’s struck by a projectile, such as a bullet, it still retains its lucid nature. There’s virtually no impact on visibility and the damage is limited only to the spot where the bullet connected with the armor. The possibility exists that this futuristic body armor could be ironed back into shape after it sustained some hits, because of the material used to create it. The material needs to be heated to around 100 degrees Celsius, which then causes it to become hot enough to melt the tiny crystallites. By heating the material, any impact from the bullet can be melded back together and returned to its normal state. Scientists believe that this sort of repair will not impact how the armor performs. Easy, fast repairs can be a great advantage for warfighters operating in remote locations and it can save money by repairing rather than replacing. In a scenario like the recent London attack, lightweight body armor approaches like the aforementioned can be very useful to protect armed officers from bladed weapons, bullets and other threats while the reduced weight can improve their speed, agility and flexibility of response. Like the Capitol building in the US, armed officers protect the building and those working in and visiting the building. Based on the information provided publicly thus far, the terrorist wielded a bladed weapon and attacked British officers. One officer was tragically killed. Guns and explosive devices are not the only methods of attack used by Islamic extremist terrorists. In Europe, terrorist plots and attacks have increasingly involved bladed weapons on foot as well the weaponization of vehicles. Islamic extremist groups such as al-Qaeda in the Arabian Peninsula (AQAP) and the Islamic State group have been actively promoting these sorts of attack methods. Just last month in Paris, a terrorist tried to launch an attack with machetes at the popular tourist site of the Louvre museum. A French soldier stopped him before there were any casualties. In 2013, two terrorists drove at British Army soldier Fusilier Lee Rigby, who was walking a street in England. The terrorists then exited the vehicle, attacked him with blades and murdered him by hacking him to death. Ultimately, advances like NRLs in transparent armor could play a vital role in amping up “invisible” walls could be used to stop both people and vehicles from storming sites and areas. By enhancing protection, it could help prevent attacks and casualties. Paris recently announced they are building an eight-foot bulletproof glass wall around the Eiffel Tower. Why? Tourist sites are attractive targets for terrorists. The goal is to stop not just bullets but prevent vehicles loaded with bombs from gaining access. Transparent armor-ed up walls mean tourists can still enjoy an uninterrupted view while benefiting from enhanced protection. Advanced armor like this can also become a deterrent to future attacks. Allison Barrie consults at the highest levels of defense, has travelled to more than 70 countries, is a lawyer with four postgraduate degrees and now the author of the new book “Future Weapons: Access Granted” covering invisible tanks through to thought-controlled fighter jets. You can click here for more information on FOX Firepower columnist and host Allison Barrie and you can follow her on Twitter @allison_barrie.